Adding one small thing to a boxed desert makes an entirely new dessert! 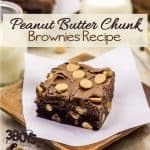 Prepare Brownies according to the directions on the box, adding the cup of Reese’s Peanut Butter Baking Chips during the mixing process. You can add a sprinkling of extra chips to the top for decoration.